Getting interested in Windows 7 after viewing its features presentation video clip recorded during the PDC 2008 keynote address? Microsoft has published a reviewer’s guide for Windows 7, which was meant to accompany the Windows 7 pre-beta build 6801 setup DVD ISO image (64-bit version) distributed to attendees of PDC 2008. The guide provides a first look into new features, enhancements, improvements, deployment, and changes from Windows Vista from the point of end users, IT professionals, developers, OEMs, and device manufacturers. This guide provides a first look at how Windows 7 helps meet the needs of both end users and IT professionals. 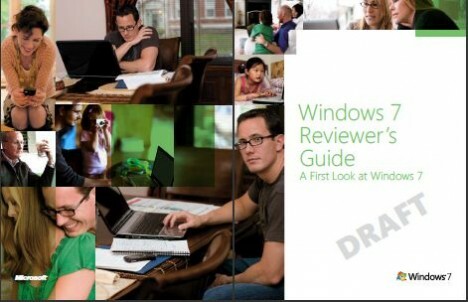 It’s written as a companion to the pre-Beta preview version of Windows 7 that Microsoft is distributing at the Professional Developer’s Conference (PDC) in October 2008. Some features described in this guide will be demonstrated at the PDC, but will not be available in the pre-Beta build Microsoft is distributing at this event. Throughout the guide, we have noted which features are not enabled in the pre-Beta build.